The countryside has often been marginalised in discussions of economic and societal development, in favour of the urban. This book aims to stimulate a debate and a re-evaluation of how the concepts of the rural, peripheral and marginal are treated in academia and policy. Approaching this theme from geographic, demographic and economic perspectives, Peter de Souza makes a compelling case for giving the periphery a prominent role as an integral part of a holistic and balanced society. The book carefully deconstructs the concept of the urban, and critiques the idea of urban-rural or centre-periphery comparisons, and presents an alternative approach to spark future discussions. The Rural and Peripheral in Regional Development will be of interest to those studying and researching in the areas of rural economics, sustainability and development, as well as those involved in rural policymaking. Peter de Souza is a Doctor of Economics and Associate Professor at the Inland Norway University of Applied Sciences. He has also worked at the universities of Göteborg, Uppsala and Örebro in Sweden, and has worked extensively as a consultant on regional and local development issues. A former member of the International Board of Regional Studies Association and Chairman of its Nordic Section, he is author of Territorial Production Complexes in the Soviet Union (1989) and co-editor of Towards New Nordic Regions (2008) and Regional Development in Northern Europe (2012). In today’s globalised, knowledge-driven and networked world, regions and cities have assumed heightened significance as the interconnected nodes of economic, social and cultural production, and as sites of new modes of economic governance and policy experimentation. 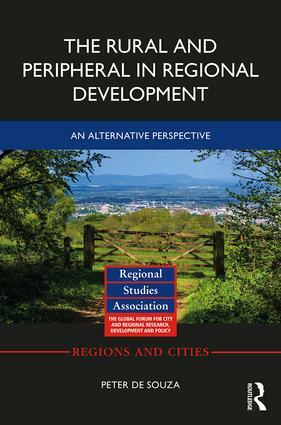 This book series brings together incisive and critically engaged international and interdisciplinary research on this resurgence of regions and cities, and should be of interest to geographers, economists, sociologists, political scientists and cultural scholars, as well as to policy-makers involved in regional and urban development. Did you know that as a Regional Studies Association member you’re entitled to a 30% discount on all Routledge books? To order, simply email Emilia Falcone (emilia.falcone@tandf.co.uk), or phone on +44 (0) 207 017 6364 and declare your RSA membership.